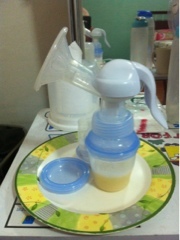 One of the things I am hoping for my 2nd pregnancy is to be able to provide breast milk to my baby for even 1 month. Before, I was able to give Reese the first extraction which is the more important, but my supply didn't last. This time, I've done my homework by taking supplement about 2 weeks before giving birth and also, getting a new manual breast pump. Gian's hospital (which is the same with his Ate) unlike before is now pro-breast feeding. That really helps to begin with since I need to know how to handle the first few days when I don't have any milk yet. They gave instruction manual and also helped us feed the baby for the first time. 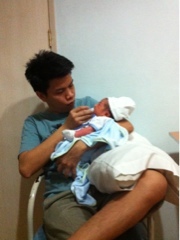 First photo is showing hubby feeding our baby using a soft medicine cup. The logic is that we should not give feeding bottle right away as this will discourage the baby from latching which is needed to trigger and sustain milk supply of the mother. That's something we both learned the first time. My breast milk, like the first time, appeared on the 5th day after giving birth. Second photo is showing my first extraction, 3 oz in 40 mins. Yes, it's not that easy. But I have to try harder this time and hope that our baby will also help along the way. More important for now is that I have the first extract to give him to keep him stronger and healthy.